AED.com proudly donated a new Physio-Control LifePak Express AED to the "I HEART Brunswick" campaign. The campaign also raised funds to purchase 5 additional AEDs from AED.com. Members of the Brunswick Junior Woman's Club with Susan Bates (center), owner of Tipsy McSway's Neighborhood Bar & Grill, home of a new AED, and Sheila Glaeser (far right), of "I HEART Brunswick"
The town came together and raised money for live saving devices. Their combined efforts have made Brunswick much safer—they are now equipped to save a life in the event of Sudden Cardiac Arrest! "I HEART BRUNSWICK" began as a five day celebration in Brunswick, GA this past March. The event was organized to promote heart health awareness and raise funds for public access AEDs around town. Sheila Glaeser, a heart disease survivor and veteran flight attendant with AED training, spearheaded the event and also contacted AED.com to inquire about a possible donation. AED.com was pleased to donate a Physio-Control LifePak Express AED to "I HEART BRUNSWICK". 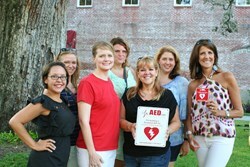 The AED.com team also helped Sheila select five additional AEDs. These units were funded by donations from community members including a $1,000 donation from the Brunswick Junior Woman's Club. The six AEDs were delivered to Brunswick this past month, and the first unit has been installed at Tipsy McSway's Neighborhood Bar & Grill. The location was selected for its central location and long hours allowing for easy and reliable access. The remaining five AEDs will be installed over the coming weeks. Sheila says she got the idea for "I HEART BRUNSWICK" following her 2nd heart surgery in 2010. She was completing her own re-qualification classes in order to return to work and was considering organizing some AED training in Brunswick. She says, "I checked with the city and realized that Brunswick had no public access AEDs in our entire historic downtown district! The concept of I HEART BRUNSWICK came about rather quickly and really brought our community together."